Heartburn Remedies: How to Get Rid of It Naturally? We’ve all suffered from heartburn from time to time. Maybe you overate. Perhaps it was a really good but rather spicy basket of sweet Thai chili chicken wings or a spicy vegan curry dish. Regardless of the cause, there is a good chance that you have had heartburn, and there is a good chance it kept you awake at night. Unfortunately, some people have to deal with the harshest form of heartburn, acid reflux, on a regular basis. So, are there any natural heartburn remedies that can help you out? If you’re looking for a good, natural way to reduce heartburn, keep reading. If you suffer from heartburn, you’ve probably scoured the Internet for tips on how to get rid of heartburn. You will find a number of over-the-counter drugs that may do the trick. Search results may also suggest that you talk to your doctor about prescription medications, which are sometimes necessary. But if your case is mild, and you prefer to avoid negative side effects or potential drug interactions, we have listed in detail some home remedies that may be able to alleviate your discomfort. How to get rid of heartburn quickly? Well, there are many things you can do to prevent heartburn from occurring in the first place. Some of these admittedly are harder than others, but they are things you may want to take into consideration if you suffer from heartburn on a regular basis. 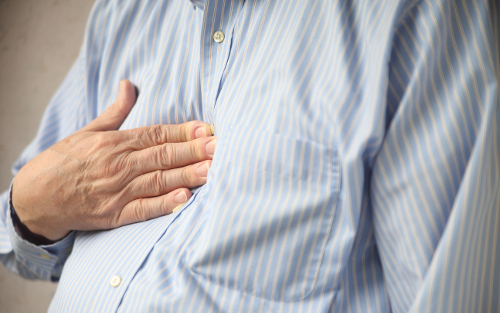 Being overweight can trigger acid reflux and heartburn. Try to maintain an ideal weight for your height and body composition. If there is a food that triggers your heartburn, avoid eating it—or at the very least, try to avoid eating it in excess. Some common trigger foods are tomato-based foods like tomato sauce or ketchup, citrus fruit and juices, caffeine, garlic, onions, fried foods, greasy and fat-laden foods like fast food, alcohol, and chocolate. However, everyone is a little different so watch for what triggers heartburn in you. Lying down after a meal, while tempting, can cause heartburn due to the positioning of the stomach. After you’ve eaten a meal, try to stay upright for a while longer. A minimum of 20 to 30 minutes should help the food start to digest properly and keep stomach acid splash back. Smoking is a cause of heartburn, plain and simple. If you quit smoking, that will help rid you of at least one possible cause of heartburn. Beyond that, smoking is bad for you in many other larger ways, quitting is a great idea for your health in general. It may seem off, but trust us, it does make a little sense. If your stomach is not constricted by what you are wearing, it’s more likely to help your food on its way through the digestive tract. Loosening your clothing or wearing loose clothing after a meal can help lessen that constriction. Loosen your belt or draw strings, untuck that shirt, it may help you out. All of the above prevention methods are great, but what if you are suffering from heartburn right now? Luckily, there are a few natural heartburn remedies that may be able to help tone down your burn. One of the easiest remedies to use for your heartburn is also one of the easiest to find in the house. Baking soda can help neutralize heartburn quickly and effectively. Take a teaspoon of baking soda and mix it in a cup of water and drink the mixture. That simple mix may end your heartburn problems. Slippery elm could have a great effect on heartburn as well as help form a natural barrier against it. It can be found at supplement and health stores in powder and pill form. Aloe vera is known for its soothing properties when it comes to wounds and burns, but it could also help with heartburn. A half cup of aloe vera juice before a meal can take the bite out of heartburn before it begins, or soothe it after it starts. One word of warning, though, aloe era can react as a laxative in some people. Betaine HCL is a natural supplement that you find at many health food stores. The HCL stands for hydrochloric acid, the main component of stomach acid. These supplements help the stomach ease digestion, causing less heartburn. But, they can interact badly with some medications so it may be best to speak with a doctor first before trying this supplement out. Deglycyrrhizinated licorice (DGL) can also help settle heartburn. This can be bought in many health food stores in tablets that you swallow and chew. This may sound ridiculous to some people, but chewing gum may actually help you with heartburn. The idea is that chewing gum helps stimulate saliva flow, which can help wash the stomach acid out of your esophagus and back into the stomach. Heartburn Cases Can Be Dealt with Naturally! Heartburn is not a lot of fun. It can make you uncomfortable, it can cause you to lose sleep, and it can make your mouth taste horrible. Luckily, as we have shown above, there are a number of home remedies for heartburn that may work for you, as well as a few prevention methods. There are cases in which you may need medications for heartburn, but you might find that one of these remedies holds you over until you get a chance to see your doctor. Carey, E., “Quick Relief for Heartburn,” Healthline, July 22, 2015; http://www.healthline.com/health/gerd/heartburn-relief#overview1, last accessed July 5, 2017. Murray, C., “7 Home Remedies for Heartburn,” Health; http://www.health.com/health/gallery/0,,20527745,00.html/view-all, last accessed July 5, 2017. Cherney, K., “Home Remedies for Acid Reflux/GERD,” Healthline, July 7, 2015; http://www.healthline.com/health/gerd/home-remedies#1, last accessed July 5, 2017.